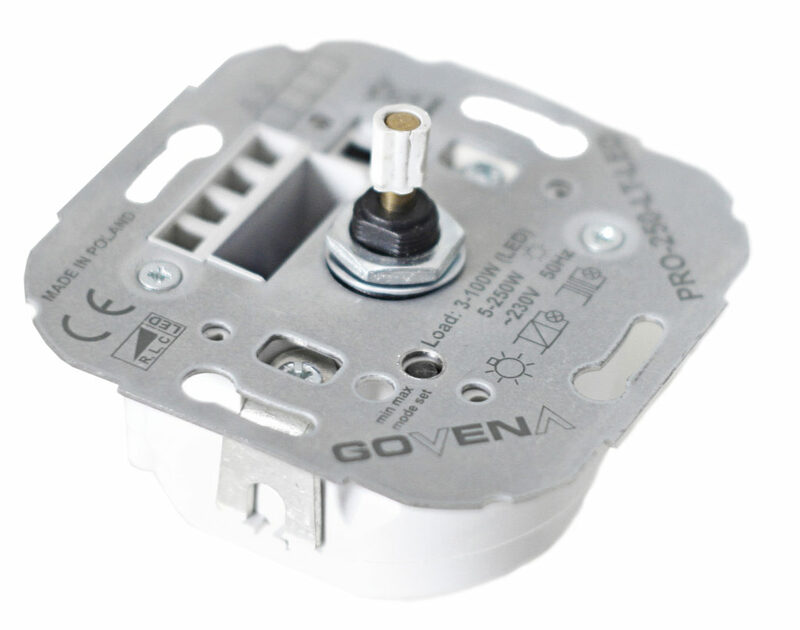 LED – Govena Lighting S.A.
Returnable thermal, overload and short-circuit protections. Expanded version of the PRO-250-LED dimmer, additionally equipped with these options – adjustment of the minimum, – adjustment of the maximum, – changing the operating mode from leading-edge to trailing-edge (change from cutting out the leading edge of the sinusoid to cutting out its trailing edge), – option to revert to factory settings These options are triggered by sequentially pressing the micro switch and controlling the potentiometer. Touch or IR-controlled by any infra-red remote control – a special simple procedure to program any randomly selected button. It is also possible to use a factory YRC8 remote dedicated to dimmers. Dimmable LED lamps and dimmable energy-saving fluorescent lamps generate high-current pulses when working with a dimmer set in L mode (leading edge). Depending on the design and rated power of these lamps, the maximum dimmer load may vary.